Linda Bilsborrow has won First Prize in the Contemporary Qults class at this year’s Festival of Quilts. The quilt, called “Byland Pieces”, is based on floor tiles from the medieval Byland Abbey which are now at the British Museum. She used both commercial and hand dyed fabrics to make the 110cm square quilt. 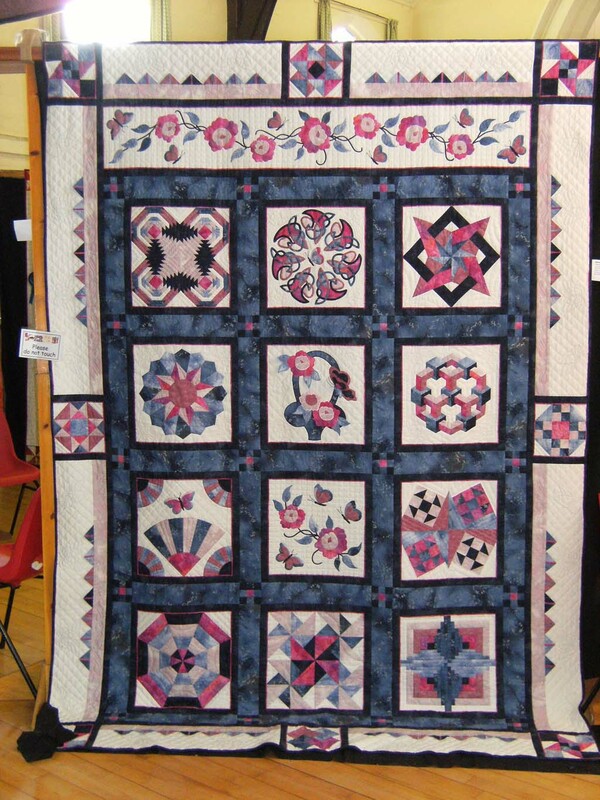 It was constructed using machine piecing and hand appliqué and was machine quilted. What a stunning quilt and a worthy winner. Many congratulations Linda! At the Great Northern Needlecraft Show 2012 in Harrogate, our Treasurer, Anne Gosling, gained two awards. It was hand stitched from a Jacquie Harvey pattern that Anne was given as part of a kit when she joined the Miniature Quilt Group. It was awarded 2nd place in the miniatures at Harrogate. This was made as part of the Quilters’ Guild Anglo-German stash challenge and was selected to be part of the exhibition which went to Germany and the Festival of Quilts. It is also going to Italy early next year and was awarded a Judges Merit at Harrogate. Carolyn Whiteley and Margaret Menzies at our February 2012 exhibition. At the Great Northern Needlecraft Show 2011 in Harrogate, Carolyn Whiteley received a Judge’s Merit for her ginko quilt from the Round Robin group. She also gained a First Prize for her scrap quilt. …and was placed third in the cushions category with “Cool Botanicals”. The Quilters’ Guild’s project Unfolding the Quilts, based at the Quilt Museum and Gallery in York, has reached the semi-finals of the National Lottery Awards, the annual search to find Britain’s favourite Lottery-funded projects, in the ‘Best Heritage Project’ category. Please vote! Our Treasurer, Anne Gosling, won the wallhanging category and Best in Show at Uttoxeter with her quilt called “Up the Garden Path”. Congratulations Anne! Further congratulations! Anne won a Judge’s Merit for “Up the Garden Path” at the Malvern Quilt Show. Anne also won the Sampler Quilt prize and a further Judge’s Merit for her beautiful sampler quilt which you may remember from our 2010 Exhibition.